I received the message below from our Zone 6 Commander, Major Peek, on Monday and I immediately posted it on all of our neighborhood message boards. Since then I have had several requests to send it out via our Safety Team network also, since there are many residents who are not members of any of the message boards. At the bottom of this report are two people and one vehicle to be on the lookout for. This is a time when “See Something – Say Something” is of vital importance to get whomever is violating our fellow residents’ homes. Yeah – these burglaries have happened at night – but this thief may very well be out and about during the daytime checking out houses. Since two of the incidents have involved entry via 2nd story windows – please make sure your ladders and those of your neighbors are well stowed and hidden away. Even though the thief reportedly unscrewed the exterior light bulbs on Amsterdam Avenue – keep all of those outside lights on anyway. If you know of neighbors who are away from home – make sure their newspapers and mail have not accumulated and collect this for them. Make sure your electronics are not visible from your windows, and above all – make sure that ALL doors and windows are locked at ALL times – whether you are in or out of your house. There have been a couple of “fake” jogger reports, too – the runner that stops and starts a lot looking in yards and cars as they are trying to look like they are just out getting some exercise and trying to blend in with the community. This sort of behavior should raise your suspicion and if you see such people while you are on the street – stop and ask them an innocent question such as if they know the time or where a certain street is (if you are comfortable doing this) – this will help to get across to them that they have been noticed. Then when you are out of their sight – make a suspicious person call to 911 noting which way they are traveling, their physical description and what they are wearing. Thanks for giving us an opportunity to address the concerns listed. We have noticed the burglary pattern that has appeared with late evening/early morning burglaries. Unfortunately, several communities are experiencing similar patterns. We are aware and we are also in dialogue with Zone Two and DeKalb County since they are also experiencing similar trends. We are also communicating with other law enforcement partners in attempts to increase visibility while we gather more leads to try and bring these criminals to justice. If possible, please send the message to your community that we need their help (eyes and ears) to combat these crimes. I can assure you that we are putting all of our officers out in the areas when we see crime trends changing. Understanding that we can’t be everywhere at the same time, having extra eyes and ears allows us to cover more ground. The cases have already been assigned to detectives and they are working diligently to resolve them. 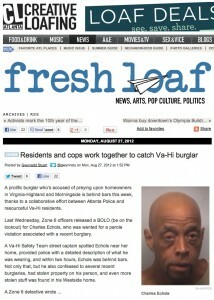 In recent days, we have been able to catch one burglar and identified some other burglars. We have caught other thieves because residents called when they noticed suspicious behavior. Yes, it will help if they make sure that ladders and other items are not left for criminals to use in their attempts to gain entry to the properties. The option of partnering (community and police) will prove to be very effective in the fight against crime. To sum it up, we will be there and we will increase our efforts in every way we can to detect and deter criminal activity. #132412694 5XX Orme Circle 08/29/13 (Thursday) Resident left at 2030, alarm went off at 2228. Rear window broken out and back door left closed but unlocked. Main floor ransacked. Electronics stolen. #132432716 10XX Amsterdam Avenue 08/31/13 (Saturday) Resident left at 1730, returned at 2250 found rear window broken and the rear door closed but unlocked. Electronics stolen. #132450776 7XX Amsterdam Avenue 09/02/13 (Sunday) Resident at home from 2300. At 0800 found side window broken and electronics stolen. Resident was home at the time of burglary. #132450991 7XX Virginia Avenue 09/02/13 (Sunday) Resident was at home at 0320 and heard noise in house, disregarded it. At 1030 resident found side window broken out and electronics stolen. Resident was home at time of burglary. 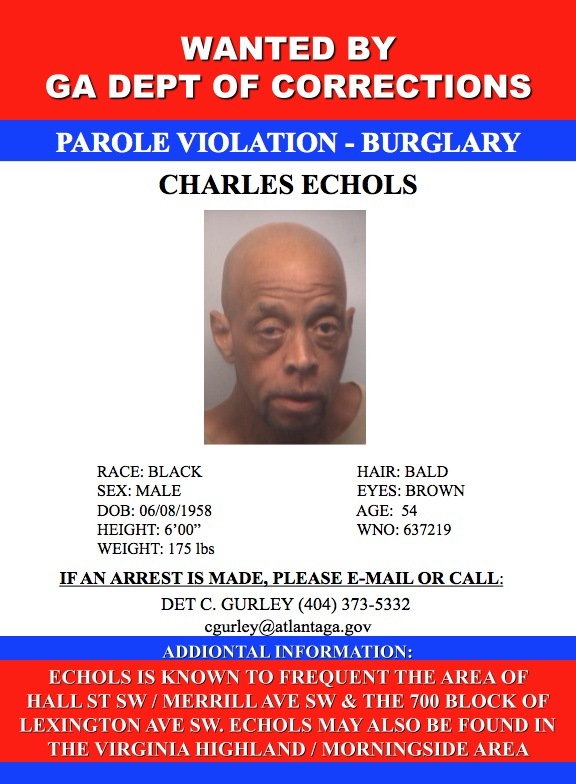 Police are asking residents to be on the lookout for a parole violator who is sought for questioning in connection with recent burglaries in the area. 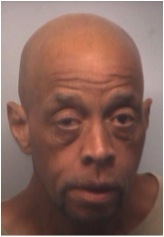 He is known to frequent both Virginia Highland and Morningside in addition to the Adair Park area of southwest Atlanta. If you have information please call 911. Our new Community Prosecutor, Josh Geller, from the DA’s office, was successful on 2/13 in a bond revocation hearing for Paul Douglas Williams, and he is now our guest in a cell on Rice Street. This is the driver of the 1998 burgindy Buick LeSabre who has been repeatedly spotted in VaHi at locations where many smash and grabs occur. He was arrested in VaHi on 1/4, released on bond the next day, and then, taking advantage of his freedom, was back in action and arrested at a Midtown smash and grab on 1/14 and bonded out again. Now – thanx to Josh, he is no longer free and the Buick is grounded. The next step now is his hearings to determine his guilt or innocence and the ensuing sentencing if warranted. Thanx to an alert Morningside resident who sent a query about a midnite encounter with a pedestrian at the corner of North Highland Avenue and East Rock Springs Road stopping passing cars stating he had been the victim of a car jacking – I would not have known that our infamous scammer was still active. After a posting on the neighborhood message boards about this incident, I learned a lot about this middle-aged, 6 foot tall, nicely dressed b/m, who has been scamming good samaritans for years now. He was located, thanx to a 911 report, and questioned by APD one recent rainy nite – but I have not gotten any word as to the outcome of this event. I counted 26 “true confessions” messages I received from folks who have given this guy 20 or 30 bucks just to get rid of him, and I am sure there are scores of other similar stories. He seems to commonly use tales of woe about needing to get to a hospital to visit a family member, he has run out of gas somewhere, is in the military and is stranded, or variations thereof. He quite often has a cellphone to his ear and quite often the encounters are at odd hours of the day or in bad weather – lending an air of authenticity to his stories. The guy has had years to perfect his craft and is quite obviously very good at it and evidently has raked in a lot of cash over time. Our Officer Cooper asks you not to let him in your car and to please call 911 immediately so he can be caught in the act sometime. Evidently he has never harmed anyone yet, and is only after your hard-earned cash – but do not take chances with him. BOLO for a green Chevy Lumina with license plate BGU-7453 – this car has been seen in Morningside following delivery trucks, sending a young black male up to porches to take packages and replace them with other already looted boxes. Call 911 immediately if this vehicle is spotted in action. Yes – we have safe delivery addresses at Intown Hardware, Urban Body, City Storage in VaHi, Richard’s Grocery in Midtown, Highland Wine & Crystal in Morningside, and Candler Park Market in Candler Park – but if you have not alerted out-of-town friends and relatives of a new address for packages – this will be for naught. This is bound to be a problem that will continue after the holidays. Thanx to the alertness of several folks here in VaHi and most recently, Kris White, the b/m driver of an older Buick with GA license plate BJV541, has been stopped and interviewed by Zone 6. He was not caught doing anything illegal this past Wednesday evening, so he could not be held – but this vehicle has been seen so many times now, especially on our prime auto larceny street locations, that the sighting of this vehicle will warrant a suspicious vehicle 911 call. This mug shot is that of Mark Harper who is still to be arrested for his warrant in reference to burglaries he committed with his partner in crime, Frederick Charles Stranahan, in March and April here in this part of the city. Stranahan was arrested at the Intown Suites on Piedmont Circle in early April charged with several offenses – the last of which I remember was a home burglary on Morningside Place. If you happen to spot Harper roaming the streets – please call 911 and report his position along with clothing being worn. This info was furnished to me by our own VaHi resident, Officer Chad Gurley, who wants to get Harper behind bars. There was an attempted break-in at the Colonnade condo building on North Highland Avenue early Sunday morning the 15th. The alert owners were at home at the time, awoke and scared him away – but just because he failed this time does not mean he won’t try here again. His physical description is as follows – white male in low to mid 30’s, about 5’10”, with jet black wavy hair and long sideburns. He was wearing a black hooded sweatshirt at that time. If he hasn’t shaved his head and cut off the sideburns – he ought to be very easy to recognize. Don’t forget to stop by Intown Hardware on North Highland Avenue to sign up to have your packages delivered to their safe address, and avoid package thefts from your front doorstep. This is a wonderful good neighbor service. Victoria Hathcox has stepped up to assume leadership for monthly cleanup sessions, and has scheduled the first session to make sure North Highland is really clean to welcome the ING Marathon on the 29th. Bring your gloves and meet at the Intown Hardware parking lot at 9 a.m. ready to do some serious pickingup. Trash bags, etc. will be supplied. We will also be painting over or erasing any graffiti along this street also. Contact Victoria at vhathcox@hotmail.com for any questions or further details. Thank you Victoria for your leadership! This can be a great family event. Don’t forget to alter your driving plans for this race day to avoid frustrations. Go to http://www.inggeorgiamarathon.com for details and race routes. Eleanor Barrineau has agreed to chair this helpful and informative training session again this year. This is scheduled for Saturday morning, May 9th at 10 at the PDL Avenue library. Those who attended last year know this is a way to learn how to better serve your neighbors and keep your corner of the world a little safer. Contact Eleanor at ebarrineau@aol.com if you would like to help her organize this event. If you attended this event last August or heard about it – you know this was a great community bonding event. Michelle Reid has stepped up to head up the event this year and is ready to start planning toward August 4th – e-mail her at mareid01@gmail.com to volunteer to help her make this year’s event bigger and better. We are bound to get a lot of media attention this year, since I am sure we will be an important campaign stop for city office candidates. Thank you Michelle for your leadership! The following incidents are gleaned from our APD Zone 6 crime stat reports for weeks # 10 and 11 of 2009, with emphasis on our Beat # 603, but with news from over all of the Zone as it pertains to us in our everyday lives. Read these reports to learn how you can alter your daily routine to lessen the chances of your becoming a victim. Granted, we can’t avoid everything, but alert and aware folks are far safer in the long run. Aggravated Assault – There was a domestic altercation in a parking lot in the 700 block of PDL Avenue involving folks from Stone Mountain. A fight in Freedom Park resulted in a homeless male being hit on the head with a beer bottle by a female. He was taken to Grady on our tax dollar. Auto Theft – A vehicle was stolen from the garage of the Briarcliff Summit building on PDL Avenue. Larceny From Auto – Vehicles were broken into on Amsterdam Walk, Adair Avenue, Frederica Street, Los Angeles Avenue, Pylant Street, Arlington Place, PDL Avenue (4), PDL Place, and Virginia Avenue. One of the thefts from PDL Avenue involved the loss of parking and fog lites – your guess is as good as mine as to why something like this would be stolen. Half of our smash and grabs were from vehicles owned by folks outside of VaHi. Remember to remind your visitors and neighbors of the Clean Car Campaign – an empty car is not much of an invitation to the guys who roam our streets looking for opportunities. All around Zone 6 in this time period – TWENTY GPS systems were taken, 5 in-dash radio/stereos were ripped out, 5 license plates were taken off and one ammo clip was stolen. Keep looking to make sure you still have a license plate. Larceny Other – YSM Design on Dutch Valley Place reported several computers are missing with no signs of forced entry. A wallet was taken from an unwatched purse at the Varsity, Jr. on Lindberg Drive. The North Highland CVS had a shoplifter caught by an officer at the corner of Greenwood and Highland. A female patron forgot her purse at closing time at the MJQ Club on PDL Avenue – her credit card had already been used by the time she checked with her bank. A Briarcliff Summit resident was missing a cellphone after a visitor left their apartment. Our PDL Avenue Kroger and Publix stores caught 4 shoplifters, and the Edgewood Target caught 3 illegal shoppers. At the Bank of America branch in East Atlanta, someone left their ATM card in the machine’s slot – and yes it was used again. Also at this same bank, a suspect tried to cash a stolen check – the police were called, but the suspect fled before the officer’s arrival. The suspect though, left the check and their I.D. at the bank. I have not heard anything lately about the naked male prowler on Briarcliff Road – any news or sightings about this problem? Let me know so I can keep the rest of the neighborhood informed. And for those of you who jog or walk solo in darkness – keep in mind the stabbing attack on Briarcliff Road in DeKalb County this week. Need I say more? Be alert, be aware, keep your car clean, and stay safe! !